This is what I am dying to do this weekend. I arrived to Friday with my head spinning. Nothing a little sunshine can't fix;) Wishing you all some good weather and a fun weekend ahead! This pic is perfect for the weekend :-) Happy Friday! i wish i could have a weekend like that image!! Agreed- all around! The week can really take it out of you, but nothing rejuvenates like some sunshine! ooohhh lala!! can i please be one of those glam ladies?! have a great weekend sweet anna! I so wish I was doing that instead of working. They look so relaxed. Agreed. Hope our weather cooperates. me too! this is my next step in 'get-ready-for-summer' to get some color hehe. I thought this pic was cute on Pinterest this week. Have a happy weekend! Just got back from the beach and I'm missing it so much!!!!! Let's lounge in hammocks together :) Have an amazing weekend girl! What a cute image! I love vintage prints. I hope you are getting some sun-soaking! I still need to find a bathing suit. THEN we'll be in business over here in my neck of the woods. I'm ready besides that! I love the photo. Seems to be taken out of an old vintage magazine. :) Really great. I am sure you had lots taking the shot(s) and enjoying the sun. Found your blog on Pinterest and totally fell in love with it!! Though i don't feel the same about "soaking up some sun" (I live in India. It would kill me) I get the idea!! Lovely blog! oh my gosh, how fun would that photo shoot have been to set up?! incredible choice Anna. 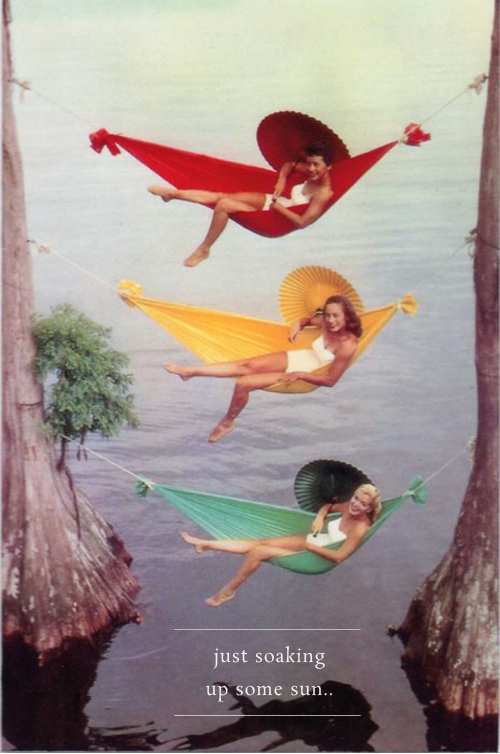 i love the colors and the lovely ladies make me wanna set up a hammock this summer somewhere magical like that too. What a playful looking image! what a beautiful picture! I'd much rather be doing that today!